There have been many controversial planning and redevelopment matters in Conservative controlled Hammersmith and Fulham over the last few years but none more so than this. Click here to watch the video and witness Hammersmith’s residents question Cllr. Stephen Greenhalgh (Con), the Leader of H&F Council about the secret negotiations his Administration has conducted with property speculators to demolish their homes. On 29th April 2009, Cllr. Greenhalgh and the Hammersmith Broadway Conservatives turned up to St Paul’s Church, Hammersmith to take part in a self-styled “Leader Listens” meeting. 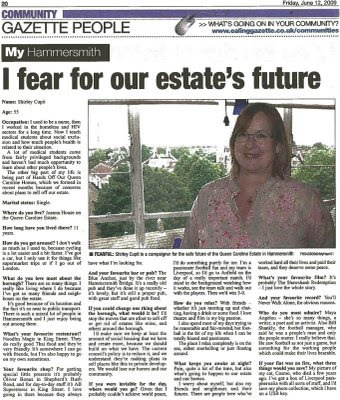 Understandably, local people are desperately worried about their homes after it emerged that Hammersmith Conservatives had met property speculators in both London and in Cannes, the luxury resort in the South of France, to discuss demolishing residents’ homes. This short video shows Cllr. Greenhalgh being forced to admit that talks have taken place after an intensive round of questioning by members of the public. The meeting went from bad to worse as residents became increasingly angry. The video doesn’t capture the lady whose voice echoed, like it had come from the heavens, as she shouted from the back of the church that Cllr. Greenhalgh “should not lie in the house of God” (which he denied doing); or the nervous blinking one Conservative candidate became afflicted with as the audience became ever more unconvinced by Cllr. Greenhalgh’s answers. But the video does demonstrate that there have been secret talks taking place over recent years about demolishing people's homes - which H&F Council has tried to cover up. Watch for yourself by clicking here. In fact, only last week, when asked about talks with developers relating to people's homes on Queen Caroline Street, H&F Council’s press office told the BBC that there had been "Absolutly no talks with any developers about the site". This video evidence shows the Leader of the Council clearly contradicting that; as does the evidence from the property speculator involved - who has also confirmed to the BBC that he had been in talks with H&F Council and its Conservative Administration about knocking down homes on Queen Caroline Street. H&F Conservatives now say that these talks are taking place only to consider what will happen around the year 2029. Again, this doesn't ring true. I currently have people in my surgery telling me that H&F Council is already making offers for them to leave their homes within the next year. One Hammersmith resident told me that an official actually encouraged him and and his family to consider moving out of the borough on the basis that they could get a much bigger property further out of central London - something he doesn't want to do. It’s also interesting to consider why would the Conservative Administration fly to the French Riviera at public expense for discussions with property speculators about issues they say won’t come to fruition for another 20 years. One leading speculator they've been in talks with will be in his 70s in 2029. 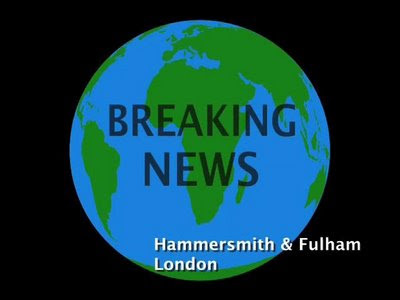 Therefore, H&F Council’s line that this entire activity currently taking place has no immediate outcome looks as untrue as what their press office originally told the BBC about not meeting any developers whatsoever. In fact, the only factor that seems to have stopped all this from progressing immediately is the credit crunch, as the banks have, for the moment, stopped lending such large amounts of cash to property developers. That's why, on 27th February this year, the prospective developer for Queen Caroline Street told the Hammersmith Gazette that he hopes to progress with the scheme “once the economy has recovered from the global downturn” next year. There are, undoubtedly, still other neighbourhoods being targeted that H&F Conservatives are hoping to keep under wraps. Currently, that’s around 2000 homes that will be affected which will mean around 5000 people needing a new place to live. Given that H&F Council no longer grants permission for any new affordable homes to rent to be built (since Boris Johnson became Mayor and allowed them to change their development priorities); and that the Conservatives are also selling off council homes onto the open market when they become vacant; then there is far less housing stock. Add in the reduction of the above affordable houses and it would be impossible to house all the displaced residents in the borough. It’s therefore easy to appreciate why the woman in the film says she and her family expect to be shipped out to east London where many new homes are being built - despite having lived in Hammersmith and Fulham for 42 years. My fellow ward councillors, Cllr. Mike Cartwright (Lab), Cllr. Lisa Nandy (Lab) and I, are determined to work with residents and fight these underhand plans. We have asked H&F Council for all papers, agendas and minutes relating to meetings that have taken place on the Conservatives' repatriation scheme. So far they are steadfastly resisting coming clean on the matter. They need to do so. H&F Council's PR department has been caught out misinforming people and is handing out disingenuous propaganda. They have a duty to be honest and let the public see what they are up to. It is all very fishy indeed. So, in the week when David Cameron told The Times that he couldn't quite remember whether he owned 3 or more houses, his model Conservative Council here in Hammersmith and Fulham is looking to remove the one and only home 5000 H&F residents currently live in. And, it looks like the only option people on average and low incomes will have is to move out of the borough - as is currently being suggested by H&F Council officers. Watch the video by clicking here and make your own mind up about what’s going on. You can click here for more information on H&F Council's demolition and repatriation scheme, including links to council minutes. It was interesting to read this piece in the Gazette (click on the photo to enlarge). There are many active residents groups around the borough. It is often a thankless task and it is my experience that they play a vital role; adding to the sense of local community and by campaigning to improve their neighbourhoods. However, Shirley Cupit and her neighbours have recently set their residents' group up with a different remit. Hands Off Our Queen Caroline Homes has been formed to literally save their homes and their community after it emerged that H&F's Conservative run Council has been in secret talks with property speculators to demolish their homes. I will report more on this very soon but, for now, please feel free to read this article here for background info.